The Granite Rib Throw is a beautiful ribbed blanket that has a nice deep texture, a modern design with points on the edges and finished off with chunky little tassels. Every time I crochet a blanket I have made it full size. I am now learning to appreciate the one person size of a throw blanket. My son can wrap this around himself and walk around without dragging in on the floor. Do not worry, this blanket is very easy to adjust to any size you would like. The Granite Rib Throw has a deep ribbed texture created by using the Yarn Over Slip Stitch. This modification to the basic slip stitch give the stitch more height and a knitted ribbed texture. 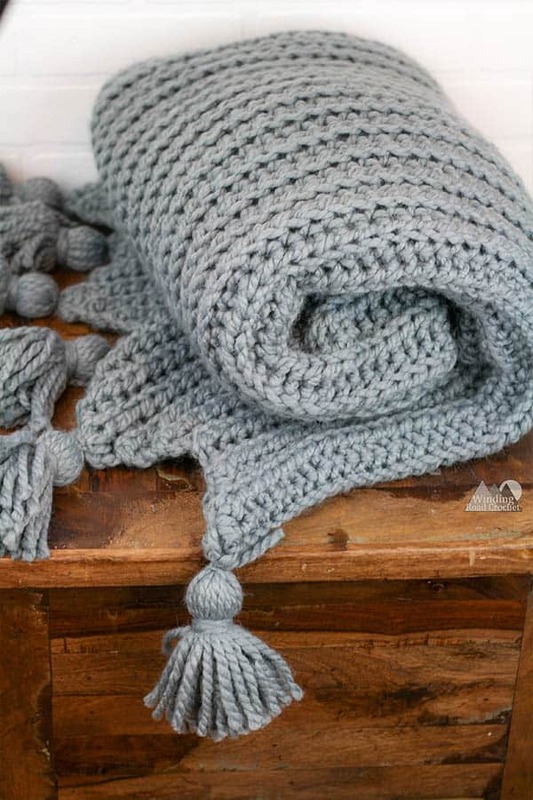 To make this Throw blanket quick and easy I used Lion Brand’s Wool Ease Thick and Quick yarn. I love how fast this yarn works up. I actually timed myself and it took 50 minutes to finish one skein. (Please note, I am NOT a super fast crocheter.) With that in mind, the Granite Rib Throw would have taken roughly 8 hours to complete. Below you will find instructions for the Yarn Over Slip Stitch as well as a photo tutorial for how I make uniform tassels. If you are a fan of video tutorials, I will have a video tutorial for this pattern next week. Love crochet? Check out all my free crochet patterns here or some of my favorites below. YOST – Yarn Over Slip Stitch – Yarn over, insert hook into the next stitch, Yarn Over and pull up a loop. You will have 3 loops on your hook, pull the first loop through the second and third loop on the hook. Your stitch is complete. YOST Dec – Yarn over, insert hook into the next stitch, Yarn Over and pull up a loop. Insert hook into the next stitch, Yarn Over and pull up a loop. You will have 4 loops on your hook, pull the first loop through all loops on the hook. Your decrease is complete. The finished size of the Throw is 60 inches by 52 inches. If you would like to make the Granite Rib Throw longer you can do so by adding as many chains as you like to the starting chain, just remember that the final blanket will be 12 chains longer than the starting chain. In order to make the throw wider you will have to add extra rows. You can repeat the last 12 rows as many times as you like to continue adding more points. It takes 12 rows to complete a point. I strive to make videos for all my patterns. Below is the video tutorial for the Granite Rib Blanket in both right and left handed. Purchase an Ad-Free Printable Version of this Pattern HERE! Add to your Raverly queue HERE! Pin the pattern to your Pinterest Boards HERE! All YOST are worked in the BLO in order to make a ribbed appearance. I included a counting tip after the pattern. Pin this pattern for later. An Ad- Free Printable PDF of this Pattern can be purchased on Ravelry. R1: Turn, Work 2 YOST in the 2nd Ch from the hook. YOST in each stitch across except the last. Work 2 YOST in the last Ch. R2-6: Ch1, turn, Work 2 YOST in the BLO of the first Stitch from the hook. YOST in the BLO in each stitch across except the last stitch. Work 2 YOST in the last Stitch. R7-12: Ch1, turn, Work a YOST Dec in the BLO over the first two stitches, YOST in the BLO of each stitch across except the last two stitches. Work a YOST Dec over the last two stitches. Fasten off and weave in your ends. R13-18: Ch1, turn, Work 2 YOST in the BLO of the first Stitch from the hook. YOST in the BLO in each stitch across except the last stitch. Work 2 YOST in the last Stitch. R19-24: Ch1, turn, Work a YOST Dec in the BLO over the first two stitches, YOST in the BLO of each stitch across except the last two stitches. Work a YOST Dec over the last two stitches. Fasten off and weave in your ends. R25-30: Ch1, turn, Work 2 YOST in the BLO of the first Stitch from the hook. YOST in the BLO in each stitch across except the last stitch. Work 2 YOST in the last Stitch. R31-36: Ch1, turn, Work a YOST Dec in the BLO over the first two stitches, YOST in the BLO of each stitch across except the last two stitches. Work a YOST Dec over the last two stitches. Fasten off and weave in your ends. R37-42: Ch1, turn, Work 2 YOST in the BLO of the first Stitch from the hook. YOST in the BLO in each stitch across except the last stitch. Work 2 YOST in the last Stitch. R43-48: Ch1, turn, Work a YOST Dec in the BLO over the first two stitches, YOST in the BLO of each stitch across except the last two stitches. Work a YOST Dec over the last two stitches. Fasten off and weave in your ends. R49-54: Ch1, turn, Work 2 YOST in the BLO of the first Stitch from the hook. YOST in the BLO in each stitch across except the last stitch. Work 2 YOST in the last Stitch. R55-60: Ch1, turn, Work a YOST Dec in the BLO over the first two stitches, YOST in the BLO of each stitch across except the last two stitches. Work a YOST Dec over the last two stitches. Fasten off and weave in your ends. R61-66: Ch1, turn, Work 2 YOST in the BLO of the first Stitch from the hook. YOST in the BLO in each stitch across except the last stitch. Work 2 YOST in the last Stitch. R67-72: Ch1, turn, Work a YOST Dec in the BLO over the first two stitches, YOST in the BLO of each stitch across except the last two stitches. Work a YOST Dec over the last two stitches. Fasten off and weave in your ends. As you have probably noticed, you will increase for 6 rows then decrease for 6 rows. To make counting easier, put a stitch marker at the beginning of the first row that you decrease. Then you will only need to count 6 rows up before changing to increasing. Tassels are a really big trend lately and they really add a modern twist to the Granite Rib Throw blanket. Below I will show you how I made my tassels and kept them as uniform as I could. First, Cut two 9 inches strands of yarn. Then take the skein and wrap the yarn around your book 30 times. You can of course do less or more, but 30 is what I used for my tassels. Next, use your yarn needle or crochet hook to tie a 9 inch strand of yarn around both ends of the yarn. Cut the yarn directly in the middle of the book. Cut both sides. Now, take your cardstock and cut it into a 4 x4 inch square. Tape two ends together to make a tube and pull one tassel through the tup until just the uneven end is sticking out the bottom. Cut a 15 inch strand of yarn and use one end to tie it around the top of the tassel about one inch from the top. Wrap the other end around the top of the tassel and tie it again. Use a crochet hook to pull the yarn ends into the center of the tassel. Use a pair of scissors to even out the yarn ends, using the cardstock tube as a guide. Pull the tube off and you have made you tassel. Use the long top tails to tie them to your Granite Rib Throw points and weave in the ends. Use the same method to make all 12 of your tassels to keep them nice and uniform. Did you make the tassels or skip them? Let me know in the comments below. Are you going to make a Granite Rib Throw for your home? I would really like to see your finished blanket. Take a picture and share it with me on any social media! Just tag me @windingroadcrochet, #windingroadcrochet, or #ourcrochetjourney. Join my Facebook Group and share your creation with the community at Our Crochet Journey Facebook Group! Written pattern, tutorials, graphs and pdfs of the Granite Rib Throw are copyright Windingroadcrochet.com. Please do not reprint or repost this content as your own, but please feel free to share this link with others. You can find more information on sharing my work with others in the Terms and Conditions Page. How can I print your patterns without all the adds? That’s lovely, what a great texture. I do love a good tassel too!